EXCLUSIVE AT NET-A-PORTER.COM. 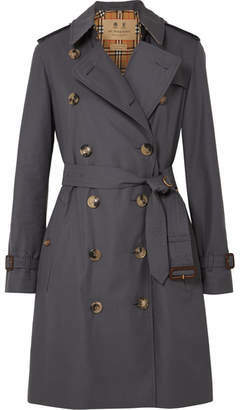 What's a more iconic design for Burberry than the trench coat? Part of an exclusive capsule designed just for us, this 'Westminster' version is made from army-green cotton-gabardine (a weatherproof cloth invented by the founder in 1879) and features the house's unmistakable checked lining. The buckled belt is perfect for cinching its oversized shape. Wear yours over everything from jeans to billowy dresses.